Detectives investigating a murder in Greenock are appealing for a man seen on CCTV to come forward. 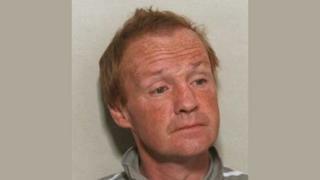 Michael Mearns, 56, who was from the town, was found with serious injuries at Greenock Cemetery at 20:00 on 30 July. He died in hospital the next day. Police Scotland want to trace a man seen looking directly towards the cemetery about 10 minutes before police were called and Mr Mearns was found. Detectives said information from the man could be "crucial" to the inquiry. Det Ch Insp Laura McLuckie, said: "We are looking to trace a man who was seen on CCTV standing on the roadway between South St and Nelson St, Greenock, at the side of the roundabout about 19:50 on Thursday 30 July. "He appears to be looking directly over towards the cemetery about 10 minutes before police were called and Michael was found seriously injured. "It is essential that we trace him to find out what he saw that night as it may be crucial to our investigation." The man was described as being white, aged 40 to 60, 5ft 6in to 5ft 9in tall, of medium build, with short, light brown or greying receding hair. He may have had tattoos on his forearms and was wearing a dark blue, short-sleeve shirt, dark jeans slightly faded at the front, and dark shoes. Det Ch Insp McLuckie added: "A team of highly-experienced officers are dedicated to this inquiry and are continuing to gather any information that will help trace who is responsible for Michael's death."